We all know that mobile phones are becoming increasingly important in the research stage of the buying cycle. Research shows that 61% of UK shoppers use their mobile phone to research products before they purchase. What is not as well known is the speed at which people go from research to purchase. That is a huge target audience for any business to put themselves in front of via Google AdWords. However, a lot of advertisers are displaying the same adverts to mobile users as they are desktop users. This is a wasted opportunity to tailor the copy and destination to the limitations of a smaller screen. If you have a product/service/app that is specific to mobile users or you want to target people as they are out and about (e.g. 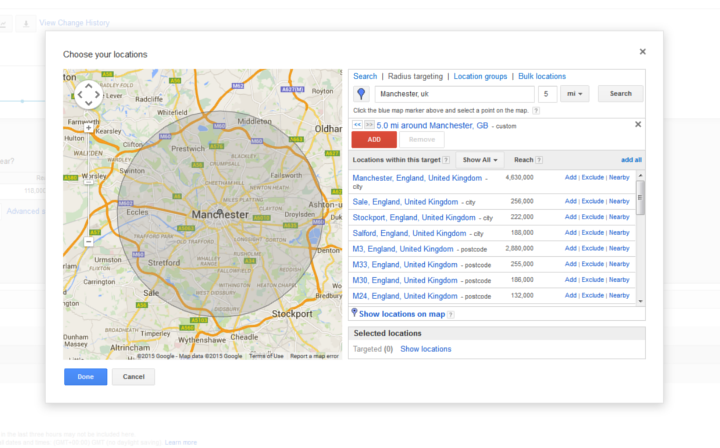 they are searching for a shop nearby), you can use Google AdWords’ targeting options to make sure you deliver a highly targeted advert, specific to that device. In this post I will show you how to create mobile optimised adverts in Google AdWords that drive more clicks and conversions. 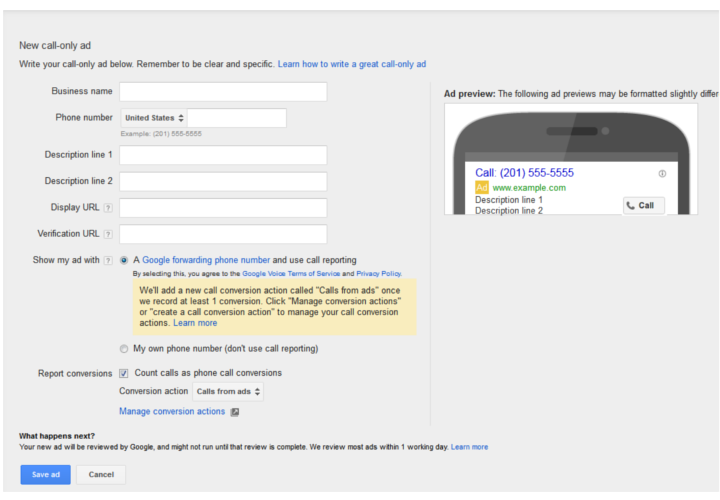 I am going to assume you already have a Google AdWords account, and you already now a lot of the basics (e.g. the structure of an account, how to research keywords etc.) So let’s get started! I would strongly recommend creating campaigns and ad groups just for your mobile adverts. The example below is for a Manchester based florist who wants to target customers looking for a local supplier whilst they are on the move. Breaking out your ad groups like this makes it much easier administering your account, including reporting, bid management, audience targeting and ad creation. It also keeps your quality score contained. Because a click is worth more to you if it comes from a mobile device, by setting bid adjustments you can increase or decrease your bids to gain more control over when and where your ad is shown. To do this, at the ad group level (which should be a mobile only ad group! ), click on the ‘Settings’ tab and then ‘devices. 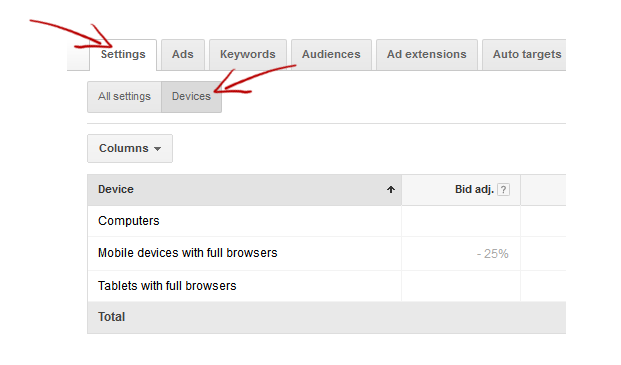 From here you can increase or decrease the amount you are willing to bid based on the user’s device. Because we want to target mobile users with this ad group, I am going to increase my bid by 100% when the search comes from a mobile device. 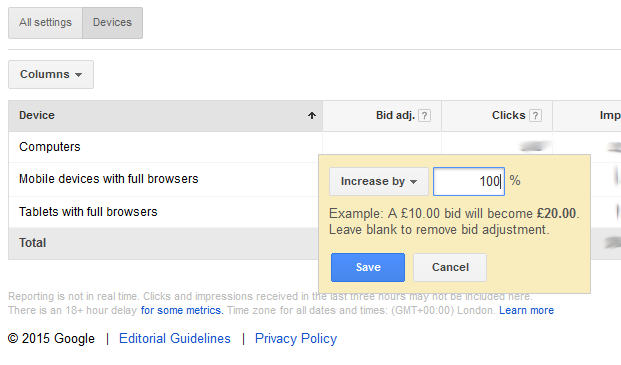 To make sure the adverts are not going to appear on desktop computers or tablets, I will then reduce those bids by 100%, essentially taking the bid down to £0. I couldn’t do this if I mixed mobile targeting with desktop targeting! There are three different ad types you can choose from to target mobile users. You can use all three, or just one, it is totally up to you based on your needs. The most straight forward way to create a mobile focused advert is using this method. When you create your advert, you can tick a check box that marks it as “mobile-preferred”, telling Google you want that advert to primarily be displayed on mobile devices. This gives you the opportunity to customize your messaging specifically to people on mobile devices. E.g. “Call us now” in your call to action. Note: Some advertisers have reported seeing these ads appearing on desktop searches, which is why Google are very clever with their wording here i.e. ‘preferred’, not guaranteed. Call only ads are designed to encourage people to call you rather than go to a website, with all clicks on these ads sending potential customers to call you from their phones. 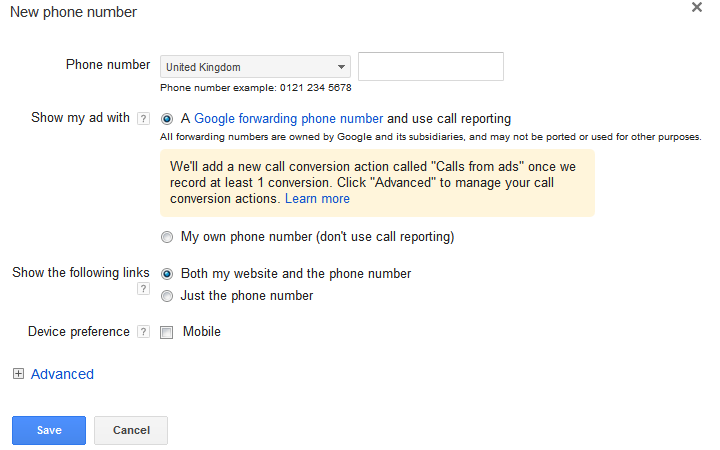 To create your call only ad, go to create a new advert as usual, and choose ‘Call-only ad’. Then simply add your details, ad copy and preferences before clicking ‘Save ad’. This is particularly useful when you sell high value goods and customers like to speak to a person to find out more, or if your business is primarily phone based commerce rather than e-commerce. Add your information and choices, and click ‘Save’. The ads in this ad group will now start to show the phone number you listed above in the ads – another reason why having your mobile ads in standalone ad groups is so important. If you are a local/regional service you can add additional parameters to ensure your advert is only shown to people in that area. You only show your ads to people who can act, making it a huge money (and time) saver. Right now I am targeting all of the UK, but my florist only serve the Manchester area, so there is the potential for a lot of wasted clicks and call here. 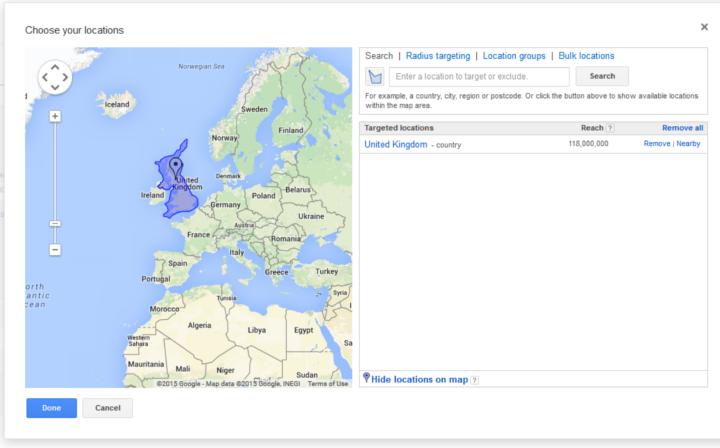 You’ll see there are a number of targeting options on the screen shot above, including a simple location field I can type in to, as well as ‘Radius targeting’, ‘Location groups’ and ‘Bulk locations’. To be as specific as possible and only target customers who are within an easy to get to distance from my store, I am going to choose ‘Radius targeting’, choosing a 5 mile radius. So, that is my ad targeting all set up driving traffic to my website. The next step is to convert them in to customers. Despite most mobile phone having decent sized screens and full internet access, full desktop websites with a lot of information become very frustrating to navigate. This is especially so when you are walking around town, and all you want is some basic information about a supplier nearby. Never send traffic to a generic home page. People on their mobile phones need the information instantly or they will bounce and continue searching elsewhere. Key info very easy to find e.g. phone number, directions, menus etc. With this in mind, direct visitors who come to your site via a mobile ad to a dedicated landing page created specifically to their needs. Google is investing a huge amount of resources in to devleoping tools and data to help small businesses target mobile searchers at the final research stage, and who are getting ready to buy. They know it has the potential to be a gold mine for them, but only if small businesses start to understand the significance of the shift we are seeing in people’s buying habits. Small businesses that get in at the ground floor can take advantage of this transitional phase, because it won’t last forever. It is inevitable that local businesses will increasingly wake up to the sales opportunities mobile saearch offers.